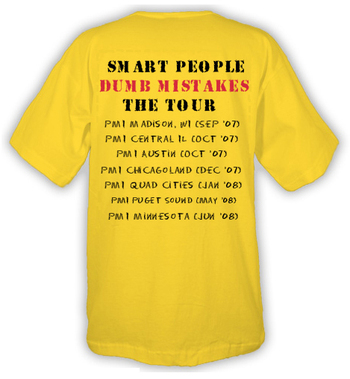 This month I am excited to be launching a series of speaking engagements titled "Smart People Dumb Mistakes". These presentations will look at how some very intelligent people have had their careers impacted by a lack of emotional intelligence. This topic is very near and dear to my heart since I struggled with a lack of emotional intelligence myself for most of my career. The presentations will look at some very public emotional breakdowns that have been career-threatening, like the Michael Richards toxic meltdown and Alec Baldwin's scathing voicemail to his daughter. We will also look at some less-known examples of minor breakdowns that various leaders have experienced and the toll that a lack of charisma can take on a project manager's career. Finally, we'll look at five specific steps that inviduals can take to protect themselves agains career threatening breakdowns and improve their charisma. I've drafted a white paper on the topic and would love to get your feedback. The only left to do is print up the T-Shirts. Good to read about your white paper. The paper is very lucidly structured underscoring why EQ is such a wonderful tool to possess and use effectively as a PM. The instances of breakdown snap your attention to the problem at hand. Thanks for sharing this with the world and making people more aware of this innate strength that they need to nurture and manage to manage the world better. btw, I didn't look at the date of this posting and thought this is the latest post from you. But now I see, it's coming to be 2 quarters now that you have been on this tour. The perspectives still look so very fresh and recent; which also shows the need for the advice in these posts is applicable anytime anywhere.